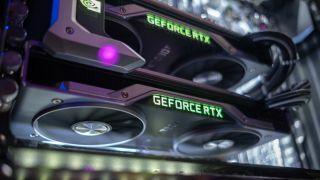 The Nvidia RTX 2080 Ti is one of the best, and most powerful, graphics card ever made, and even though it's still very new there are a couple of tasty Black Friday deals for the GPU floating about. Overclockers UK has cut the price of various versions of the RTX 2080 Ti by Palit and Inno3D by up to £200, which makes these expensive graphics card a little bit more affordable. The cards are also included in Nvidia's promotion which gets you Battlefield V for free, which sweetens the deal further – so if you've been tempted to buy an RTX 2080 Ti for your gaming rig, now is a great time to make the plunge. For more deals on graphics cards and other hardware, make sure you check out our pick of the best Black Friday components. What's the best graphics card of 2018?